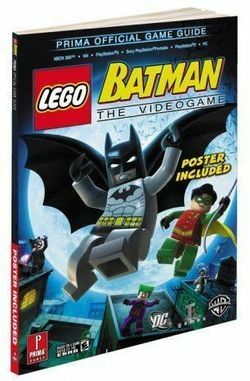 LEGO Batman: The Video Game Prima Guide is a Prima Guide for the video game LEGO Batman: The Videogame, based on the Batman theme and released in 2008. There are many errors in the book, such as the lack of civilians in peril locations, lack to mention the Mad Hatter's double-jump and Man-Bat's superstrength, and some vehicles missing, such as the Mad Hatter's glider and the Bat-Tank:. Also, the pictures of the henchmen (except for the Penguin Henchman) are incorrect. Facts about "LEGO Batman: The Videogame Prima Guide"
This page was last edited on 9 January 2016, at 21:04.